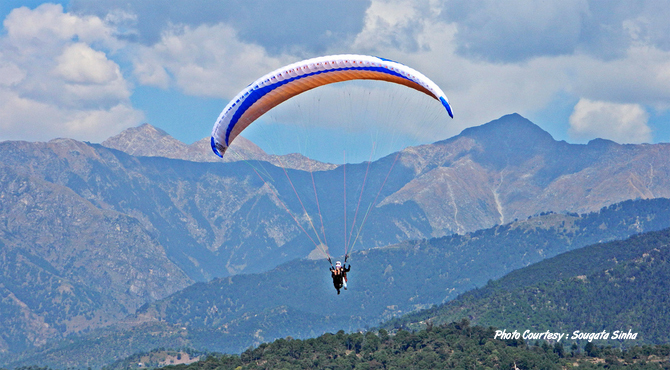 Sheltered by the mountains and surrounded by tea gardens, Bir a small village with a Tibetan Colony and monasteries in Kangra district, Himachal Pradesh; serves as a landing ground and a base for Hang and Para gliders. Their launching (take-off) destination 'Billing', is a little meadow at 2,400m (8500 ft) on the Dhauladhar ranges, 14-km up from Bir. This meadow one of the wonders of nature, perfectly designed as a launch pad, has become a legend on the international paragliding circuits and a destination for World Champion Paraglider pilots. The meadow directly above the villages of Bir and Chaugan, is one of the best gliding sites in the world. From Billing, the range runs all the way to Dharamsala, separating the Kangra valley from Champa. To the north of the meadow is the high peaks and to the south the plains. The fall from the meadow is about one kilometre and an average straight TTB ( top to bottom) flight to the Chaughan landing area lasts for about 25-30 minutes. If the conditions (like weather, wind speed and direction, cloud base of 4000-5000m etc) are right, one can make a 'Cross Country' distance flight from Billing to Manali or Billing to Dharamsala (90km). The flying is generally 'ridge-hopping' ie. getting lift from the ridges or cliff edges running down from the main spine of the range. 'Ridge lifts' caused by wind hitting a hillside and 'Thermals' (columns of hot air) are used by the glider to rise higher. Thermalling is an essential skill for flying in Billing. In Billing, thermals are found on a regular basis over a temple hence called the 'Thermal Devta', halfway down the eastern spur running down to Bir. The temple can be identified from the air by a red ribbon tied to a tree top. In the Billing - Dharamsala flight route there are 15 or so ridges. You can have the company of the Huge Himalayan Griffin Vultures during flight. Billing is also easily top- landable. Billing is renowned the world over for having the distinction of organizing the very first Paragliding competition according to the rules of Federation Aeronautique International. The Department of Tourism and Civil Aviation, Government of Himachal Pradesh organised the 'Para Gliding Pre world Cup' at Billing- Bir in the month of October 2003. It is also 'the place' for Hang gliding and Para Sailing. Every May, an annual Himalayan Hang Gliding Rally is organised at Billing. Aero sports club at Bir and Himachal Pradesh Tourism Department ( Phone: 91-177-223959, E-mail: Contact Us ) gives assistance. It is advisable to bring warm flight clothing, wind proof jackets, winter flight suits, rough trousers, ankle support shoes since the weather tends to be chilly when one is air borne. Thick gloves/socks are also recommended.